The disaster caused by Cyclone Idai will worsen the country’s already fragile economic outlook. It could result in emergency IMF funding, though restoration of the suspended Standby Credit Facility (SCF) still seems some way off. Politically speaking, the disaster could provide a small fillip for an otherwise bruised Frelimo that faces growing public distrust and internal turmoil ahead of this year’s elections. The devastation created by Cyclone Idai, which struck the coastal areas of central Mozambique with torrential rains and winds of up to 177 km/h (106 mph) on 14 March, will severely impact the country’s economy. Idai’s humanitarian toll could be even worse than the floods of 2000, in which 700 people lost their lives, 45,000 had to be rescued and more than 460,000 were displaced or left homeless. In the wake of the 2000 flood, annual GDP growth dropped to 1.7%, from 7.8% in 1999. While estimates of the damage from the 2019 floods are not yet available, Mozambique’s already fragile economic recovery from the debt crisis (GDP growth softened to 3.25% in 2018) seems likely to take a further hit this year if agricultural damage is extensive and the Beira logistics corridor suffers sustained disruption. The IMF, which concluded a staff visit on 27 March, expects “the macroeconomic effects of Cyclone Idai and reconstruction costs…[to] be very significant.” The Fund is considering emergency funding to the tune of USD 120mn, though a resumption of its suspended USD 283mn Standby Credit Facility (SCF) looks unlikely before the 2019 elections and will be contingent on how the government handles the controversial USD 2.2bn debts. Although Finance Minister Adriano Maleiane continues to say that all three loans – for the moribund Ematum, ProIndicus and Mozambique Asset Management (MAM) companies – should be paid, the outlook for the loans appears to be diverging. Officials say a restructuring deal with sovereign bondholders is still to be concluded. At the same time, Mozambique’s recently lodged case against Credit Suisse at the London High Court creates the possibility that the state guarantee for the Credit Suisse-arranged ProIndicus debt could be voided. For now, the legal action seems to be motivated by the need to ensure that the IMF can omit the ProIndicus debt from its debt sustainability update, and there are deep divisions within Frelimo over how aggressively to pursue the case to avoid payment. The strategy for MAM, arranged by VTB, seems to be least clear; no similar court case to ProIndicus has been brought. Instead, the government seems to be trying to turn MAM into a vaguely viable entity. While dealing with the debts will be vital to laying the foundations for a resumption of full IMF support, the Fund’s latest Article IV consultation already signals a nascent rapprochement. The IMF’s 13-28 March visit seemed to take the longer view towards the LNG-fueled future. The single most important upside for Maputo could come in the form of final investment decisions on the two Rovuma LNG ventures. The timelines for both projects keep slipping but are currently expected between June (Area 1) and August (Area 4) 2019. On the political front, the ramifications of Idai will likely be a delay of the 2019 presidential, legislative and provincial elections, which are currently scheduled for 15 October. The National Elections Commission (CNE) has indefinitely postponed the election registration process, which was due to start on 1 April, pending conditions in cyclone-hit areas. It has given the Council of Ministers the choice of going ahead with the current election date or delaying until 15 November or 15 December (into the rainy season). Beyond a potential election delay, the humanitarian crisis could provide a small electoral boost to a ruling party badly bruised by Mozambique’s debt crisis. For one, it could reduce voter registration and turnout in opposition strongholds like Sofala province. Moreover, the opposition has thus far been very quiet as Frelimo has owned the crisis response, which has been led by Celso Correia (Minister of Land, Environment and Rural Development) and Max Tonela (Minister of Mineral Resources and Energy), Nyusi’s close confidantes, who are the more dynamic and pragmatic faces of Frelimo. While a Frelimo victory in the presidential and legislative polls remains the base case, the debt and corruption crisis has seriously dented the party’s image. Already in the 2018 local elections, Frelimo’s declining share of the vote (52%) and unprecedentedly close votes in key economic hubs (including Matola, Moatize and Nacala Port) signaled a worrying trend for the ruling party ahead of the 2019 ballot. 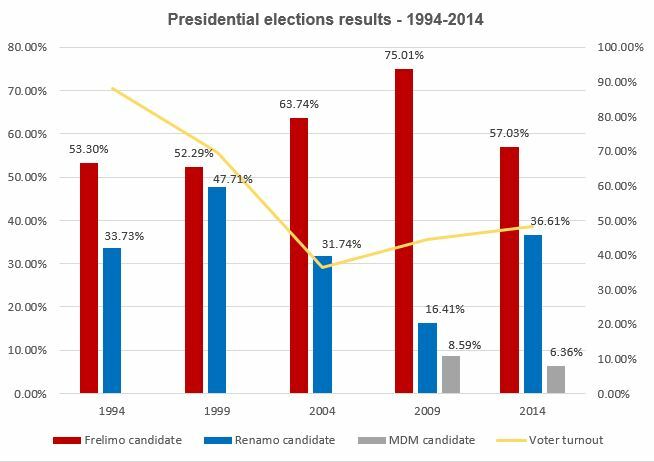 This year, Frelimo’s margins (57% in the 2014 presidential election) could come under pressure from Renamo, particularly if voter turnout is high. The fallout from the debt crisis, particularly the US indictment, has left the government’s prior strategy of pursuing debt restructuring deals while limiting accountability in tatters. In its scramble to secure the extradition of former finance minister Manuel Chang from South Africa, the attorney-general’s office (PGR) has moved against Frelimo figures closely associated with ex-president Armando Guebuza. Since mid-February, various suspects have been arrested and 20 accused, including the chairman of all three companies (Antonio do Rosario) but also the ex-president’s son, Ndambi Guebuza. Several other key Guebuza allies, for example former labor minister turned ambassador to Angola Helena Taipo, also face charges of corruption in unrelated cases. The developments have caused deep rifts between Frelimo’s Guebuza and Nyusi factions, which could seriously destabilize Frelimo internally just months before the elections. In a context of internal party turmoil, Nyusi’s candidacy for the presidency, while likely, is not yet guaranteed. The South African legal process relating to Chang’s extradition could last several more weeks if not months. If legally viable, the South African administration would vastly prefer to extradite Chang to Mozambique rather than the US, given the country’s historic ties and strategic importance to South Africa. Preparing for prosecutions could help Frelimo: it could allow the party to claim to be cleaning up its badly bruised image with voters ahead of the elections (even if, as cynics suspect, the cases ultimately stall after the vote); and it could help to smooth over relations with overseas donors and the IMF.